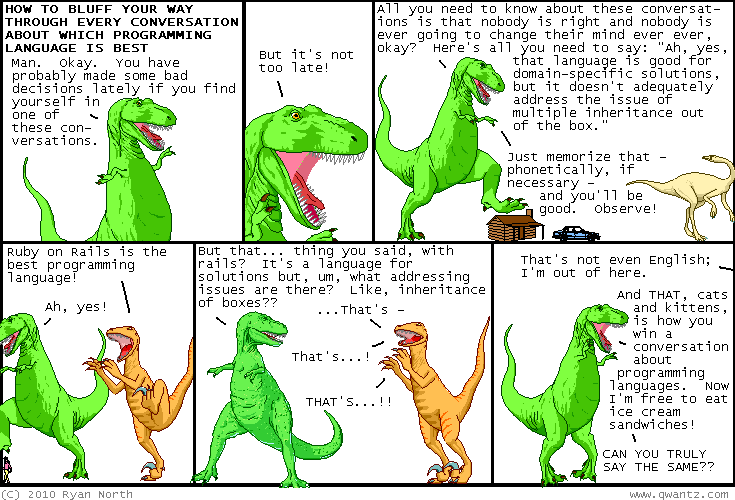 Dinosaur Comics - August 27th, 2010 - awesome fun times! August 27th, 2010: Has anyone had a fully excellent week? If so then you have unlocked Excellent Week: Fun Times Good Times and I am happy for you! If you follow me on Twitter you'll already know that last night I had dinner next to a guy on a first date who was like a mixture between Dwight Schrute and Babycakes; it was just as awesome as it sounds! One year ago today: the wikipedia page on pedigree collapse writes about "the common historical tendency to marry those within walking distance", which i find to be ENTIRELY CHARMING. you're within walking distance, baby! let's get hitched!